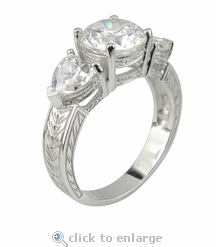 This Amore 2 Carat Cubic Zirconia Round with Hearts Three Stone Estate Style Engraved Engagement Ring is a beauty that has all the elements of a fine estate style jewelry. 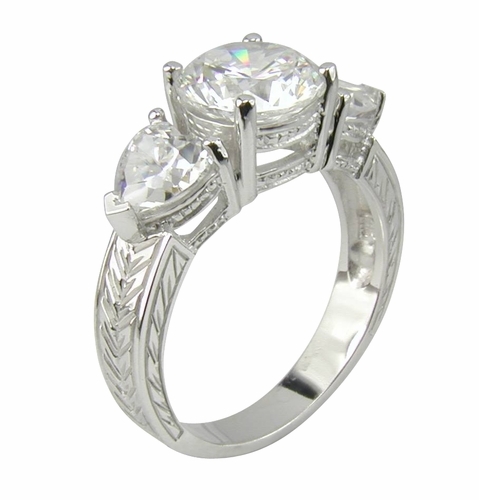 The details on this engraved engagement ring are crisp and rich and the Russian formula cubic zirconia are all hand cut and hand polished to exact diamond specifications. The engraved solitaire features a 2 carat 8mm round diamond look cz center with a single .75 carat 5mm heart shaped stone on each side, for a total carat weight of 3.5 carats. 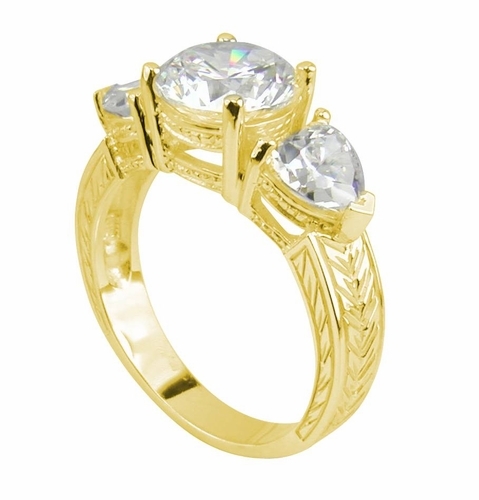 Match this three stone estate antique style ring with the band of your choice to create a very personalized wedding or bridal set. This ring is shown here in 14k white gold or 14k yellow gold but you can also have Ziamond make this ring for you in 18k gold or Platinum via special order. Due to extremely low pricing, all clearance sales are final. Clearance items may be sized for an additional fee of $35. Simply type in your request in the comment box at the end of the order. Sizing below a 5 or above an 8 is subject to additional fees, call for a quote.